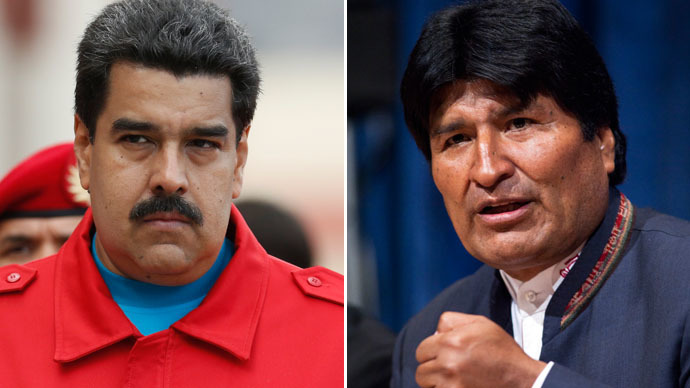 Bolivia’s Foreign Ministry has joined a chorus of condemnation over US sanctions on Venezuela. A statement called on the US to “abandon its interventionist practices,” shortly after the rest of Latin America bonded in defense of Caracas. Setting off the Latin outcry was US President Barack Obama’s decision to label Venezuela a ‘national security threat’ in early March, something President Nicolas Maduro countered by saying that Obama had taken it upon himself to “defeat” and “control” the country. La Paz is striking back at Washington in defense of Caracas, after Bolivian President Evo Morales earlier this week signaled his support for Maduro. In a Thursday document the Foreign Ministry expressed its “regret” at Obama’s stance, saying “Bolivia rejects these interventionist actions of the US government to violate the sovereignty and self-determination of the Venezuelan people. These undemocratic actions of President Barack Obama threaten the peace and security of all countries in Latin America and the Caribbean. “Bolivia reiterates its full support for the legitimate government of brother Nicolas Maduro, a president democratically elected by his people, and pledge our solidarity to the Venezuelan people in this unfair and difficult time in which democracy is again trying to be sacrificed to serve foreign interests,” the document also read. Some of the loudest criticism in Latin America came from Cuba, which questioned Obama’s decision-making wisdom. Calling the president’s actions “arbitrary and aggressive,” its Foreign Ministry also issued a statement. “How is Venezuela a threat to the United States? Thousands of kilometers away, without strategic weapons and without the resources … to conspire against the US constitutional order; the [White House] declaration has little credibility,” Cuban newspaper Granma cited the document as saying. The 12-nation bloc has agreed to hold a high-level meeting on March 14 in Quito, Ecuador, to discuss how to go about responding the new measures. The ad hoc meeting was announced urgently by Correa shortly after Obama’s remarks on how Venezuela is a threat to the US. Like other Latin-American partners, Correa sees this as a move to isolate Caracas and finish the job that the opposition could not. The nations are also part of the anti-imperialist ALBA (Bolivarian Alliance of the Peoples of Our America) group of Latin American and Caribbean nations, which earlier said that the move by Obama “constitutes an unprecedented aggression against that country and thus our region. Washington and Caracas have been at odds since Venezuela's iconic former leader Hugo Chavez came to power in 2000. The two had not had full diplomatic representation since 2008. The country had recently grappled with heavy unrest, which was quelled. Later in February the president announced victory over the alleged US-sponsored coup, which he says was masterminded by Vice-President Joe Biden himself – the first time an accusation of such gravity was made to a crowd of thousands and on national television.